If your chimney is leaking into your home (either through the flue or along the sides of your chimney), then you have an issue that requires immediate attention. Leaks can occur for all sorts of reasons, so it’s best to have a professional take a look to assess the situation. What’s worse is that the source of a leak can be difficult to locate for the untrained eye, because leaks can move across surfaces, so you really may not know the origin. For example, if you have a leak caused by poor flashing around the base of your chimney, that leak may enter your attic, move across the rafters, and make its way into a wall that doesn’t appear to be close to the chimney. When you notice a leak, just give us a call for an inspection — we’ll find the problem and fix it before any more damage can occur. Your chimney can be blocked by a variety of obstructions. You could have birds that have built a nest in your chimney. You could have a rodent that is stuck in your flue. Your flue could be caked with soot and creosote buildup. Your damper may be stuck shut. Or you may have snow and ice covering the hole for your chimney. Regardless of the blockage, these scenarios can prove rather hazardous, and you should never light a fire in your fireplace if you suspect that the chimney is blocked. And unfortunately, you may only notice that your chimney is blocked if the smoke isn’t escaping your home through the chimney. If you’d like to test whether or not your chimney is blocked before you light a fire, you may be able to hear air flow through the chimney (listen for a small amount of wind) — just make sure the damper is open. You can also inspect your chimney visually to check if the damper is open (use a flashlight to inspect your damper), and you may be able to see light through the entirety of your chimney during the daytime if it is unobstructed. Just be wary that if you’re inspecting your chimney and fireplace yourself that you’re liable to get some soot on you! If you do notice a blockage in your chimney flue, count on us for an inspection and cleaning. If the exterior of your chimney has bricks missing or damaged, then it is overdue for repairs. Chimneys are certainly built to last, yet their exposure to the elements means that they won’t last forever. Bricks will eventually deteriorate and fail, and the mortar holding your chimney’s bricks together will also lose its integrity. Your chimney is liable to be damaged from falling branches, high winds, hail, other precipitation, and changing temperatures, so it’s a good idea to inspect and maintain the brickwork of your chimney regularly. We recommend an inspection at least once per year. As we mentioned, your mortar endures all of the elements that the bricks of your chimney endure. And, over time, the mortar will slowly chip away. Fortunately, brick chimneys can be repaired with tuckpointing, a technique where the mortar is replenished to reestablish the structural support it was intended to provide. Mortar may also be applied to the surfaces of your bricks to restore their protective functionality. We use colored mortars that match your current brick and mortar colors to perform any necessary tuckpointing. If your chimney is outfitted with a cap or flashing, then these metal components are liable to rust over time. And eventually, that rust can lead to leaks and other wear and tear for your chimney. If you’ve noticed that your chimney cap or flashing have rusted, then it may be time to replace those components. A new cap will help to stave off leaks, and flashing will ensure that your roof properly sheds water. The crown of your chimney provides added protection against the brunt of Mother Nature’s forces. And, if your crown is damaged (or missing altogether), then your bricks and mortar will wear down far more quickly. Most modern chimneys are topped off with a crown that can be made of metal, concrete, or stone — since these materials are highly resilient in the face of the elements. 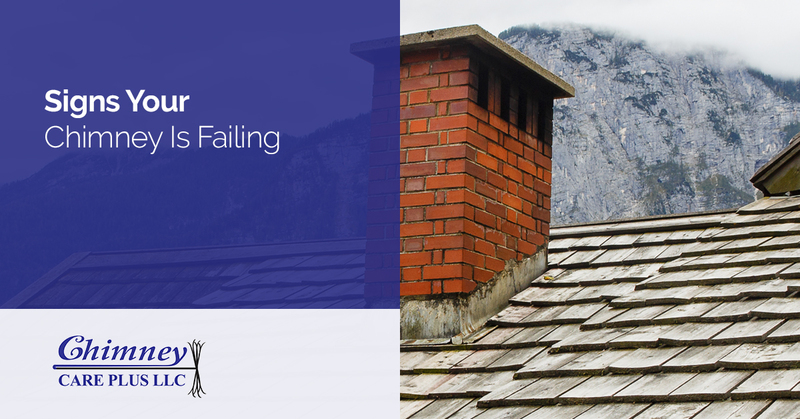 However, even the strongest chimney crowns can fail — and when they do, Chimney Care Plus is here to help. As we mentioned, flashing is liable to fail thanks to rust. In addition, it can eventually become detached from your chimney and roof, which can lead to leaks and other damage. If you’ve noticed a leak in your home, or you suspect that your chimney flashing is no longer doing its job, then we can take a look at it. Your flue should remain as clean as possible — which is difficult when smoke is constantly traveling through your chimney. If you haven’t had the flue of your chimney cleaned in a couple years, or if you use your chimney regularly throughout the year, then you should be especially wary that flue buildup can be dangerous. Soot and creosote slowly buildup along the lining of chimneys, and, with enough buildup, this mixture can ignite and lead to a house fire. That’s why it’s so crucial to have your fireplace inspected once a year and cleaned regularly. Again, we recommend yearly inspections for most household chimneys. Your chimney damper is one of the only mechanical components of your chimney. As such, it’s liable to malfunction or break. If you have a chimney damper that no longer opens or closes as you try to adjust it, then you won’t be able to maintain a fire in your fireplace, as you’d like. If there’s no change in airflow as you try to adjust the damper of your chimney, then you may need a repair, or you may have a blockage within your chimney. Here at Chimney Care Plus, we specialize in all things chimney, and we can address any issue that you may have with your chimney, both within your house or on top of your roof. If you’ve noticed any of the aforementioned issues, or if you simply need to schedule your yearly inspection, then don’t hesitate to reach out to us. We proudly serve our neighbors here in Frederick and the surrounding counties with chimney repair and inspection services.